This is the first article from Ashmei that we've reviewed on road.cc, part of their initial cycling range after expanding out of the running market. Check out our article from last November to find out more about the brand. It's a hugely impressive start. The front of the jacket, the shoulders, the tops of the arms and the pockets, are made from a lightweight polyester/polyurethane that Ashmei say has been developed especially for them. The fabric is described as wind and water resistant, although it pretty much stops both. The rest of the jacket – the centre of the back and the underside of the arms – is made from a mix of merino wool, nylon and Spandex (elastane). These are the less exposed areas when you're cycling so they don't need to shut the weather out in the same way. These panels add extra breathability, allowing moist air out, and the loose inner weave helps wick damp away from your base layer so you can stay comfortable across a wide range of temperatures. The yoke is stitched down only in the centre so you get ventilation there, and generously long pit zips provide more climate control. You can open the front zip from either the top or the bottom – or both – to let more air in. That zip is water resistant and comes with a baffle behind it so there's no chance of wind getting through, and it's offset to minimise the chance of it irritating your chin. There's a chinguard at the top too, and a similar fold at the bottom to stop the zip damaging your Lycra. The cut is slim enough to avoid flapping and there's stretch in both fabrics, especially the merino one, so you won't feel constricted if you're anything other than stick thin. In typical cycling style, the rear is cut longer than the front to keep your covered up when you're down on the drops, and there's also a mudflap back there that you can drop down in wet conditions. Little magnets hold it out of the way when it's not needed. Rather than three standard issue cargo pockets at the back, you get four, all differently sized, one designed to take a mini pump. (We have a pre-production sample here; they'll actually be slightly deeper in real life, and some more bar tacks are being added to add more strength). There are two more zipped and water resistant pockets back there too for things like your mobile phone, one of them with an exit port for an earphone lead. There's a tiny pocket tucked away in the baffle of the front zip too, just large enough to take a key for your front door or bike lock. Other features include a silicone gripper inside the bottom hem and inner cuffs that you can either leave tucked inside or (I'm not sure if they're designed for this) pull down and wear inside the cuffs of your gloves to prevent draughty wrists. Reflective trim on both the back and at the front of the shoulders and broad white stripes on the chest and rear add lots of visibility. Phew! There's a whole lot going on here, but his jacket doesn't feel at all cluttered. In fact, it's only now that I come to write everything down that I realise how many different features there are because they're all really well integrated. Thanks to the wind resistance, you get a whole lot of warmth considering the jacket's light weight (it's a lot lighter than Rapha's Classic Softshell, for example, if you happen to know that jacket). I've been using it in temperatures down to about 9°C although some people will be happy in colder weather than that. All in all, this is really, really well-designed with plenty of genuinely useful features. Looks are always a matter of personal taste but I reckon it's really stylish too. A great jacket. 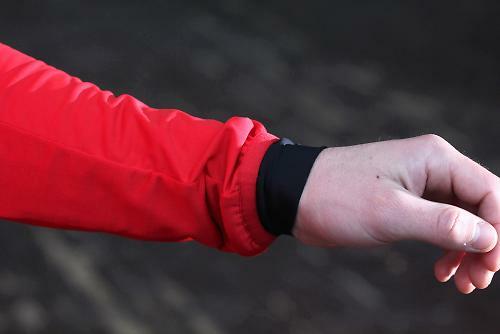 Here's Ashmei's full write-up: "Our cycle softshell jacket has been designed from the fibre up. We don't simply select an available fabric or see what the competition is up to and develop our own version. Our brief starts with the riders requirements, be it heat regulation, wind or water protection, stretch, UV protection or maximum breathability. We then start to develop fabrics using the perfect fibre combination and include the best technology available to create fabrics that answer our brief. "The Cycle Softshell Jacket uses two fabrics to provide the ultimate microclimate that provides excellent comfort. The first fabric is our ultra breathable softshell fabric which is placed on the front and over the shoulders to protect you against wind and rain. This fabric has been developed to our own unique specification to provide enough protection from the elements with maximum breathability, preventing you from overheating. The second fabric is placed on the rear of the jacket and is made from a high stretch merino blend. This material helps to regulate your temperature and keeps you cool when the sun is out but warms you when it's cold. 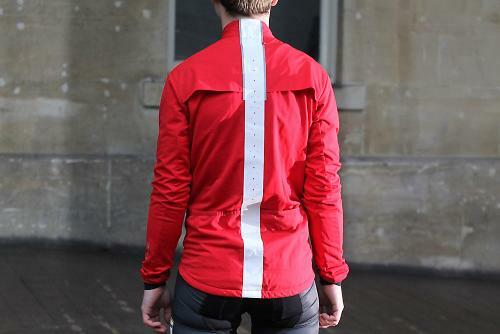 This merino fabric is also super stretchy, meaning you feel unrestricted when riding on the drops. 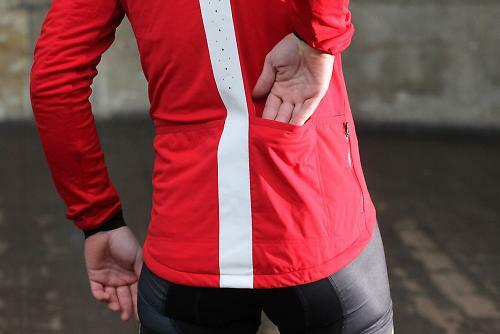 "The Cycle Softshell Jacket has been tailored to a cyclists profile, eliminating fabric where not required to minimise excess fabric flapping in the wind. 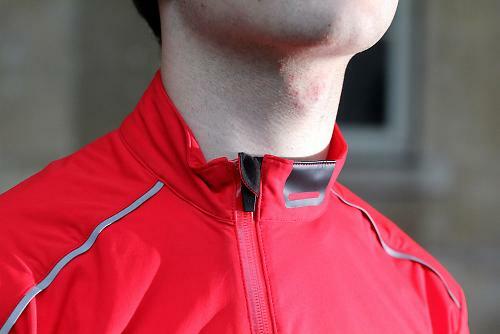 The front zip is offset so that it finishes to the side of the neck when zipped up, stopping it irritating the chin (and beards where applicable) and also reduce bulk around the voice box when wearing the ashmei zipped neck jersey. 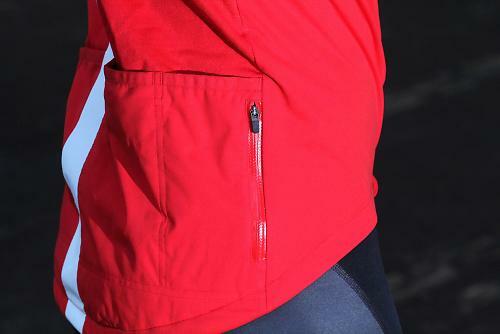 Pit zips add ventilation that flows cool air through the jacket to the rear vents. We've included 6 rear pockets including a zipped water-resistant pocket for your phone and a hidden zipped security pocket. There is even a designated pocket for your pump. "The sleeves are articulated and include a soft touch, instant fit inner cuff that stops wind whistling up the sleeves. The rear has a hidden water resistant mud flap that you can easily pull down to protect your bibs in the rain and magnetically stowed when not required. The jacket is finished with reflective detailing that include a chest and rear stripe to help you be seen at night, while maintaining a stylish and classic look." £210 is far from cheap but, considering the high quality on offer here and the excellent features, it's not outrageous. 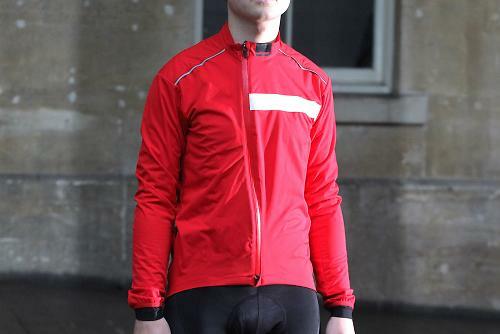 It's more expensive than Vulpine's Softshell Jacket /content/review/123332-vulpine-softshell-jacket (£175), for example, but not as Rapha's (£240) (of course, each of those jackets is made from different materials and offers different features, so they're not directly comparable). Ashmei are quite clear that they don't design their clothing to hit price points. They say that they make it the best they can and only then determine how much they need to charge. With that approach, prices are bound to be high. It puts in an exceptional performance. The light weight and the attention to detail in the design. Of course, you'd rather it was a bit cheaper, but that's always the way. Yes, £210 is a lot to pay but this jacket really is a bit special. The attention to detail is superb. Just looking at the Raphael glove review above. 44 comments, this boutique brand met with indifference. Raphael have the lovers and haters. All emotional responses. For these guys to assimilate the same customers it is gonna have to inspire. Not rotate a line thru 90 degrees and set the rrp the same. Looking forward to receiving mine tomorrow and seeing how it measures up to my Castelli Alpha - I'm looking for something that sits imbetween that and a sportswool jersey weather-wise. I had a great chat with one of the guys from the company at the Rouleur Classic: really passionate about their products. They do a try before you buy scheme: £1 for a month, send it back if you don't like it. Doesn't look like the cut is as neat as I would like. 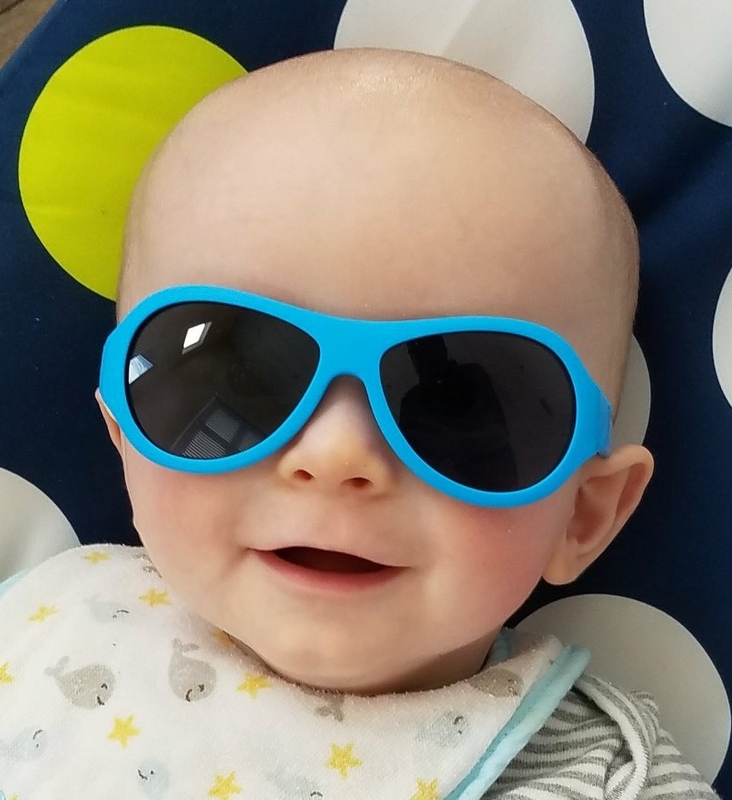 Might suit the leisure cyclist more.